I can’t believe that July 4th, 2013, is behind us already. 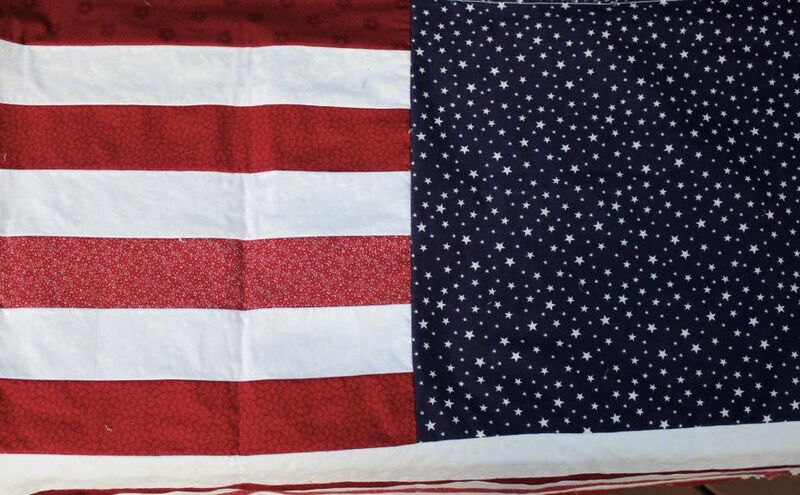 Although it’s a bit overdue, I wanted to share this patriotic rag quilt that I managed to stitch up just a few days before our holiday party. I didn’t have a pattern, but I had a great stash of 100% cotton red, white and blue fabrics. If you’re familiar with the basics of rag quilting, you can zip this one up quickly. If you haven’t stitched a rag quilt, there are great tutorials on You Tube. I cut the 6 strips which formed the lower half of the flag 3 1/4″ inch wide x 42″ long. The seven strips to the right of the blue field* were cut 3 1/4″ wide by 26 1/2″ long. I stitched these strips together before attaching the blue field, which was cut 16″ wide by 16 1/4″ high. All seams were sewn 1/2″ wide. Additionally, I placed a 3 1/4″ wide x 42″ long strip of white muslin between each strip set, making each strip three layers. The muslin adds a little weight to the flag and helps fluff-up the seams after washing. After the flag was fully assembled, I trimmed and squared-off any edges that weren’t exactly perfect. Since I did not attach a binding, I top-stitched 1/2″ from the edge, along each side, before clipping** the seams. 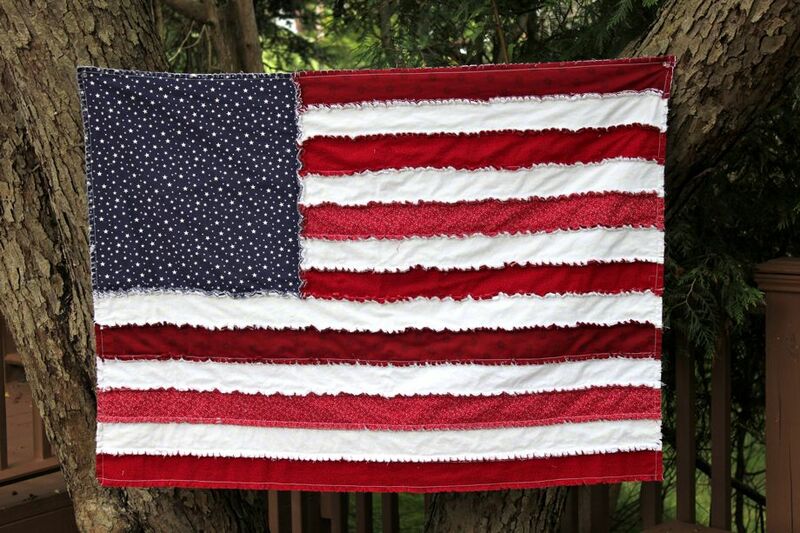 This flag is easy to stitch, and a great way to showcase your patriotic pride! “…and forever in peace may you wave”. **Thank you, Teresa, for saving my aching hand by recommending the Fiskars Rag Quilter Snip. It made the job 200% easier and was a great use of my 50% off JoAnn’s coupon!! What a beautiful flag! Is there anything you can’t do! I was thinking of making this for a foreign exchange student that is leaving. Would this work as a blanket? It might be a little small for a blanket, and there is no batting between the layers. 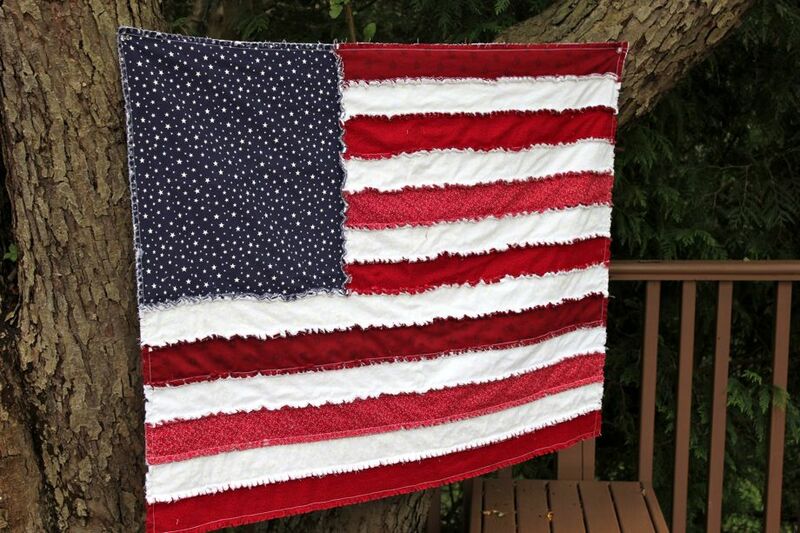 If you google “rag quilt” you will see countless samples of rag quilts (along with instructions) that would be better-suited as a blanket, and I’m sure that any one of them would look beautiful in red/white/blue.